Thermal conductivity of constituent materials plays a critical role in many applications requiring component cooling or heat insulation. These applications include electronic packaging, design of new heat sink materials, advanced structural ceramics used in propulsion, and many other high thermal demand situations. Over the past few decades, the laser flash method has developed into one of the most accurate and flexible techniques for the measurement of the thermal conductivity of various kinds of solids, powders and liquids. Engineers at CMC Laboratories were some of the original developers of laser flash thermal conductivity testing. 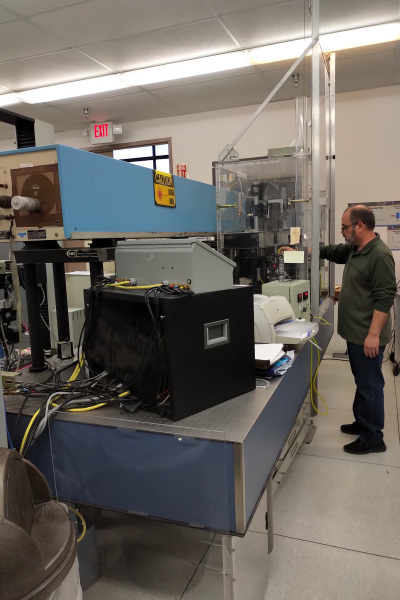 With over 30 years in TC measurement analysis coupled with CMC's extensive background in materials science, we are able to provide extremely precise measurement results as well as a strong understanding of the specific material properties or defects that influence thermal conduction. CMC's Laser Flash system covers the widest measuring range of all techniques, 0.1 up to 2000W/m*K for Thermal Conductivity and 0.01 up to 1000 mm2/s for Thermal Diffusivity. Highest Accuracy and Repeatability, +/- 1.5-3% depending on material and specimen construction. CMC's Laser Flash system was designed to accept a wide range of sample sizes in order to test realistic components without size reductions. (This avoids limitations common in many other laser flash systems of 10-25mm in diameter). CMC can test thermal conductivity on the following samples ranges. Laser Flash Thermal Diffusivity (TD) measurements consists of pulse heating the front side of a sample surface with a short laser pulse, and then measuring the time evolution of the back surface temperature using an infrared detector. 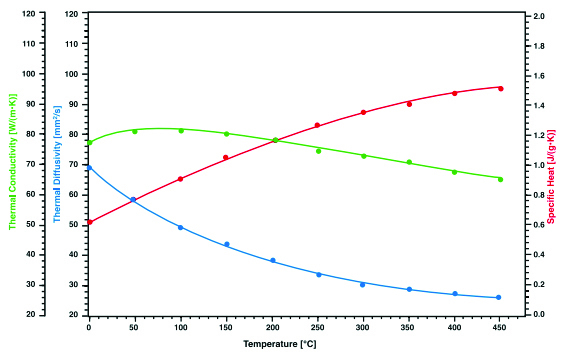 The resulting temperature profile curve is tailored using a one dimensiontal heat flow model (1D Model). The sample's TD is then extracted from the model and thermal conductivity (TC) can be calculated using the TD, density, and specific heat. Sample thickness and sample size can affect the 1D model and may effect the accuracy of the TD results. CMC Laboratories has developed a 1D model that allows for proper curve fitting evaluation to insure the 1D heat flow condition has been met. CMC can adjust apertures in the system to optimize the 1D condition. CMC's Laser Flash system complies with national and international standards ASTM E-1461, DIN 30905, and DIN EN 821. Aluminum, Copper, and Graphite are perfect materials to show the performance of CMC's Laser Flash Thermal Conductivity measurement capability as a function of temperature. Measured values are within 2% of published literature values. CMC's system has been commonly used to certify standards for NIST as well as routineprocess monitoring coupons for the ceramics, telecommunications, aerospace, and semiconductor industries. 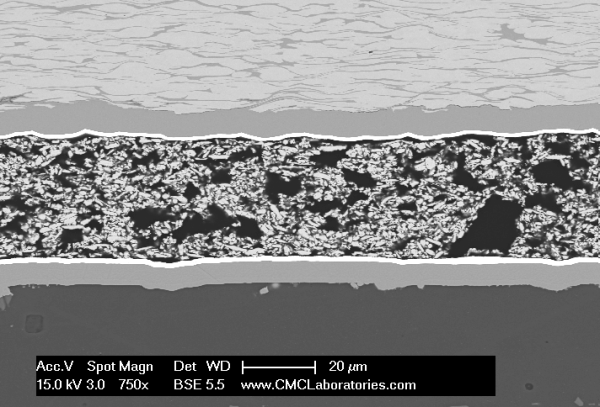 Utilizing CMC's Laser Flash technique and applying advanced heat flow models, CMC Laboratories has the capability of measuring the thermal conductivity of layered structures. Typically this technique is used to find the thermal conductivity of an interlayer between two materials with known thermal conductivity. The interlayer thermal conductivity includes both the bulk thermal conductivity of the interlayer and the thermal impedance of the interfaces. This technique is perfect for measuring a material stack-up as it is used in real life. This is especially important in understanding the thermal interface impedance of a die attach or TIM where segregation at the interfaces can have large impacts on the thermal conductivity. CMC utilizes its laser flash measurement technique to measure both in-plane thermal conductivity (X-Y plane) and out-of-plane thermal conductivity (Z direction). These can both can often be done on the same sample without any elaborate sample preparation. The out-of-plane measurement utilizes the laser pulse to heat the top side of the sample while an IR detection system monitors the backside temperature. This is the standard geometry described above. For in-plane thermal conductivity measurements, a topside patterned mask is applied to the sample. The mask causes a ring shaped laser heating pattern on sample surface. Temperature on the backside is montored at a point in the center of this illuminated ring. In this geometry, heat originates in the ring pattern and is detected as it travels along the XY plane toward the center. This methodology is ideal for measuring samples with anisotropic thermal conductivity (higher XY thermal conductivity vs. Z direction) and very thin, high thermal conducting samples where heat transit times in the z direction may be too short to measure accurately. 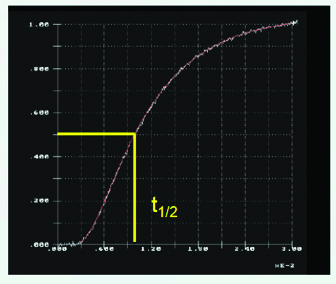 Certain composits are generally good examples of an anisotropic thermal conducting material. 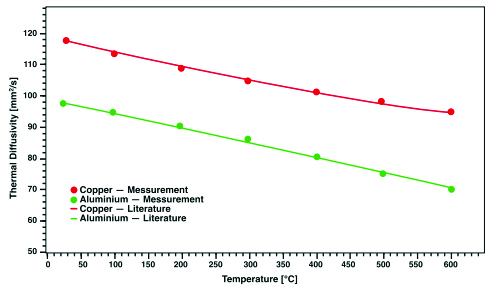 For example a copper graphite composite, where the thermal conductivity on graphite is different along the fireber direction than across the fiber. Example of a high thermal conductivity thin film would be CVD Diamond. CMC has built a custom laser flash thermal conductivity measurement system with the goal of over coming many of the short-comings of commercial systems.